These heavy-duty stands are the countertop iPad mounts many retailers opt for. What can these tablet fixtures do for a business? 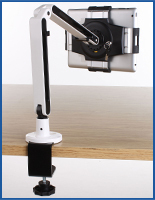 Countertop iPad mounts help you bring the latest and greatest in Apple technology directly to your customers. A portable kiosk has the perfect size and shape to be placed front and center, directly where customers have straightforward access. 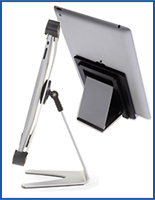 iPad stands, also known as Apple tablet accessories, elevate your branding in the eyes of customers as well. Upload custom apps and product relevant programs to the iPad, which will help customers to associate your name with good service and helpful information. And when your brand is doing that well in the eyes of the customers, they're sure to return in the future for other retail needs. These countertop iPad mounts also make customer checkout a breeze when paired with a square card reader. Touchscreens aren't cheap, and you want to make sure your investment is protected. Locking enclosures keep your screen secure while still making them easily accessible. What are some of the safety features of these tablet enclosures? Many countertop iPad mounts have security screws on four (4) corners. These screws may be swapped out for thumb screws if the holder is going to be used in a residential setting. Kensington lock and cable systems. This system has a unique design where the cable can be locked into the stand itself and then looped around an immovable object (table leg, cabinet leg, etc.). Once that's set into place it is incredibly hard for the stand to be removed from the premises. Lock and key systems are also used to keep the tablets securely within the case itself. Many of the stands have rotating mounts to customize the view. What makes this a security feature is that the touchscreen computers don't have to be removed from the stands in order to do so, keeping them firmly locked in place while any changes are made. The security features, while important, aren't the only things these desktop kiosks have to offer a business. They're easy to use, featuring some of the speediest installation possible. You are able to set up your display in a matter of minutes, reaching your customers with a minimum of fuss. 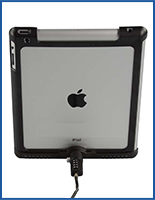 The design of the iPad case itself also provides simple access to some of the operating features of the device. Special cut-outs are worked into the case so authorized users may reach the home and power buttons. There are also openings to keep the speakers free and to plug in the charging cord while on display. Being able to ensure your tablet is consistently powered while on display is a great way to guarantee customers and passersby will be exposed to your promo materials. 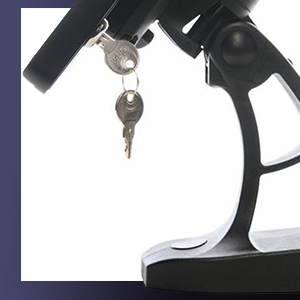 The bases of many of these tabletop mounts feature a rubber padded base to help prevent slipping around being used. Similar foam pads are often incorporated into the interior of the cases, allowing them to be used with the different generations of iPads. Be sure to see if your model is compatible with the stand prior to purchase as not every model will support all generations. On the designs in this category the mounting brackets can be rotated a full 360-degrees, giving you the choice of showing them in a portrait or landscape orientation. And even better, you don't have to take the tablets off of the stand in order to do so. 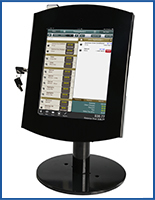 The kiosk mounts and other accessories are offered in a variety of price points to meet the needs of many different businesses.